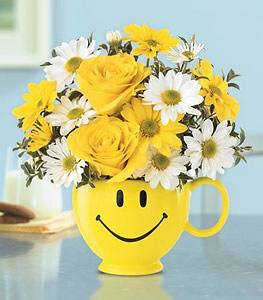 They cant help but feel a little better when a bright yellow happy face carrying a cheerful bouquet arrives. Smiles guaranteed. Daisies and roses are delivered in a Be Happy mug. Note: a different coffee mug may be substituted if the item pictured is not available.